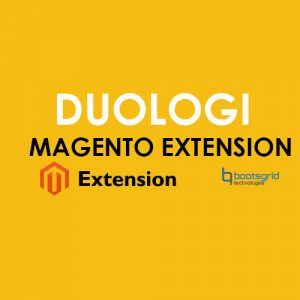 Customers to browse large sets of products quickly and intuitively is mission-critical for your Magento store. 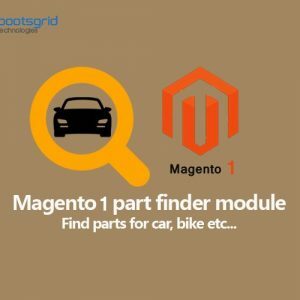 Bootsgrid Layered Navigation provides a solution to this problem. It allows your users to jump directly and instantly to whatever they are interested in. 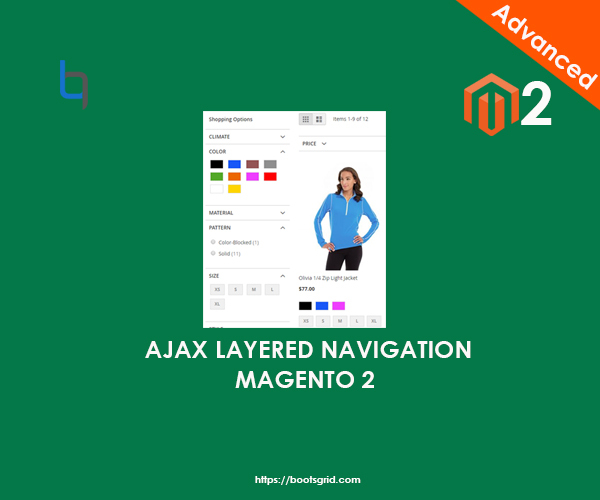 A vast improvement over the default Magento layered navigation with multiple-categories filter, attribute filter, visual price slider, visual color swatch and more. Easy to find and display products based on category and sub-categories. 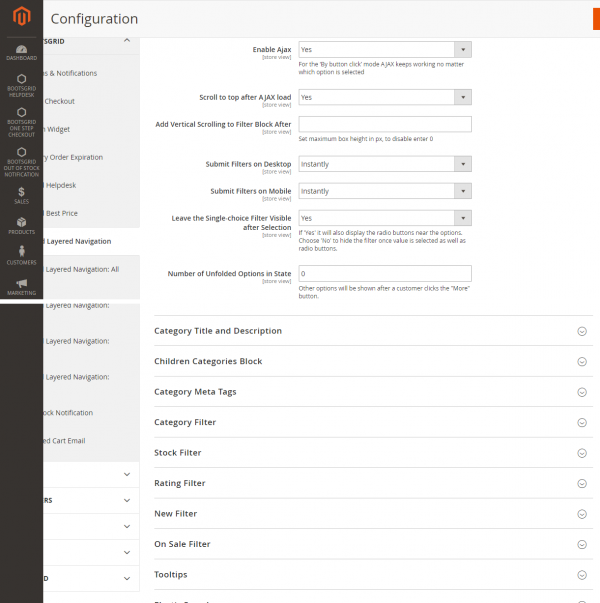 Multiple Attributes Filter – User can filter the products by multiple attribute. 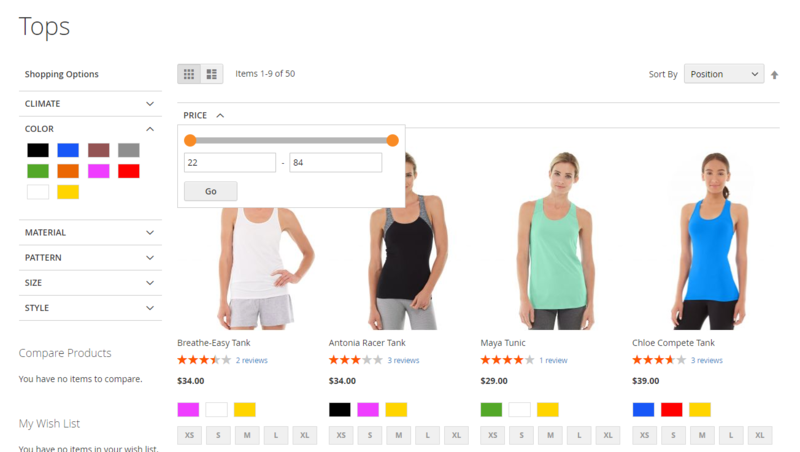 Visual Price Slider – Allows to display price navigation as scrollable range slider, thus the customers can easily search the store catalog by price. Visual Color Swatch – Swatches can be defined as a component of the visual color attribute or text-based value. Instant Filter Results – Displays the number of matching records found instantly, without any page reloads. 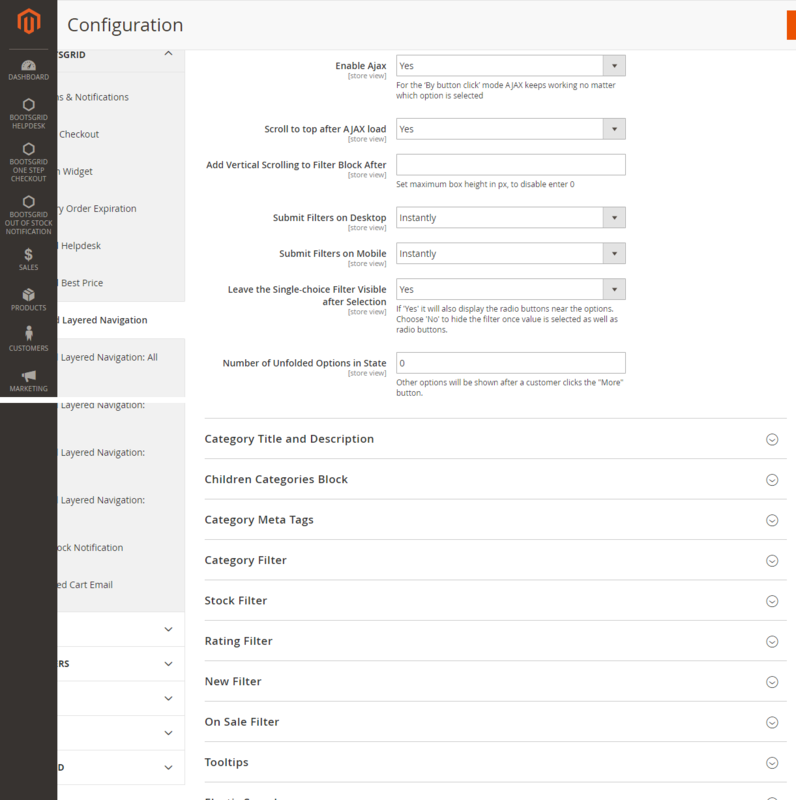 When each filter option is checked and counted against every product in category, the pagination and results sorting will be updated instantly. Free Shop by Brand Addon – Users can create a separate brand page with a handy A-Z filter quickly, a go-to destination for users to find new collections and brands that they know and trust. It lets you feature a subset of top brands on a slideshow flexibly across any CMS page, static block at your choice. Brands in the Layered Navigation sidebar – Allow shoppers to view products by brand in addition to attribute filters, via either visual swatch or text swatch. Search Engine Optimization – Bootsgrid Layered Navigation ensure all category pages visible to search engines & avoid drawbacks of duplicate content. 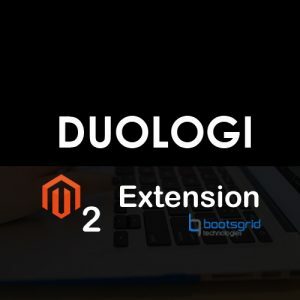 Themes Support – Compatible with any magento2 responsive themes. An extremely simple extension, but the one you can’t do without. Virtually no setup required. I’ve been using this plugin for six months. It doesn’t require additional configuration you have to worry about. Cool feature with an interactive frame. A bit frustrated about Ajax not included by default, hope to see it in the next update. Definitely recommend. I just want to say thank you for fixing this issue with swatches in Layered Navigation. This was a nice little gift for Valentine’s Day. I would like to save few things here. This is very useful and high performance module for every new online store. I Get a great extension from here. I used this module six months ago. I have a received excellent support from the techies for installing this module. Very needful extension for ecommerce. Simple and very on demand module. I literally helpless until buy this extension. Thank you Bootsgrid for solving my problem in online store. 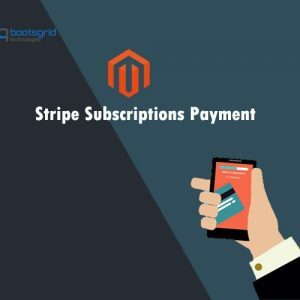 Most significant extension for every online store. Nice support from team of Bootsgrid while I am exploring my queries. Nice user friendly module and easy installation process there is no kind of any difficulties.